Flying cars, time machine these are some promising technologies which we expect to see within the next few years. We get excited thinking about these far-fetched technologies that inspire our future generations to learn science, math and engineering. What does the future of technology in the classroom hold in reality? What type of technologies will inspire our future inventors and engineers, scientists and shape their minds? These are some questions which keep boggling our minds when we think of the future of our children and their education. Either you are a school teacher or a parent; we always want to give them the best education. This amazing technology seems far closer to reality since Google’s confirmed the launch of the Augmented Reality Eye-Wear glasses. These glasses are actually a data layer on top of our eyes. It doesn’t matter if students are wearing any style of glasses because all data is sent directly to their Augmented Reality contact lenses. No doubt, we have digital media textbooks, but it will be more exciting to imagine having Hitler sitting on a desk and explaining the World War. This enriching experience enjoyed by students inside and outside the classroom would be wonderful. This technology will bring about a revolution in the world of science. The future of technology like biometrics will help in understanding the emotional & physical state of children and their learning in the classroom. Based on signals of biometrics, course material can be tailored individually. To understand the performance of students, their physical traits like heart rate, facial expression, odour and skin moisture, could be measured, studied and taken action on. Teachers can easily understand whether any children need additional assistance with the behavioural signs such as gait typing, rhythm, and voice of children. This technology will also help to understand what teaching techniques will work best for students. Read More: Artificial Intelligence in education – How it improves the learning experience? The concept of multi-touch has been a hot topic in the world of technology since the huge success of iPhone. Even many companies like Microsoft have been experimenting on multi-touch surfaces, consumers have become addicted to it. With the advancement of technology, this multi-touch surface has become more advanced and cheaper; we expect some more products with multi-touch surfaces that will be helpful in the learning of student and change the future of technology in the classroom. Just think of a classroom where every student is working together with their peers across the globe and employing computer-generated objects right in front of them. With this technology, virtual tools, streamed video and millions of online resources are available to teachers and student with a single swipe of the desk. 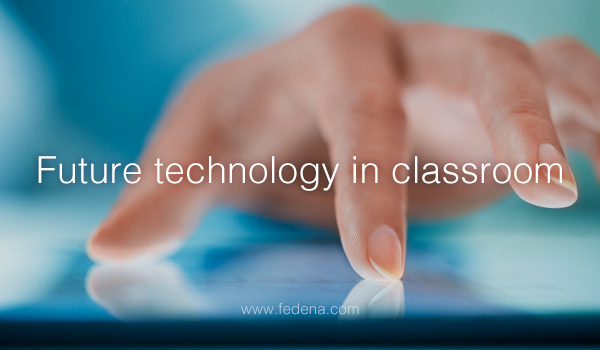 As we are proceeding to more advanced technology in 2016, the future of classroom sounds amazing. Every time you visit our blog, you will definitely find something new to read. So stay tuned for more! Previous PostPrevious Do Or Don’t: Listening To Music While Studying?